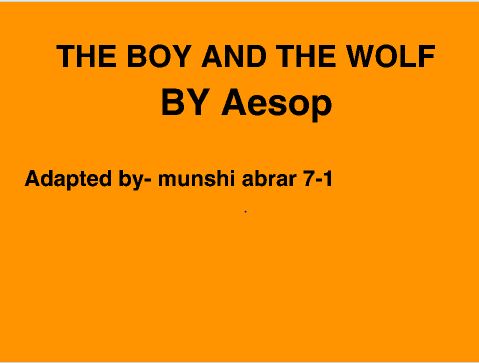 The boy and the wolf is a fable by one of the most famous author Aesop, is about a wolf who does not do what his life mission is which is to go against humans and kill them. But in the story he does not do this and when the boy asks him to play a song his wolf pack kills him. The moral was that you should not be who you are not. In the fable the wolf was a piper instead of a butcher. I first wrote my script which had what the charecters were going to say. It had the 2 acts were the desicion was being made one decision was the posotive and the otherone was the negative. Then i made the story board which showed what the animation would look like. After storyboard I made the actual animation. The storyboard clearly expressed my final decision and I was very pleased with it. I worked in both school and home, however, more time was spent at home. The final scratch animation gives consequences on both versions of Act 2 based on the main decision made at end of Act 1. In act IIA the wolf plays a song for the boy which makes him a piper making the wolf get killed. In act IIB the wolf kills the boy and becomes the butcher making the wolf pack proud. 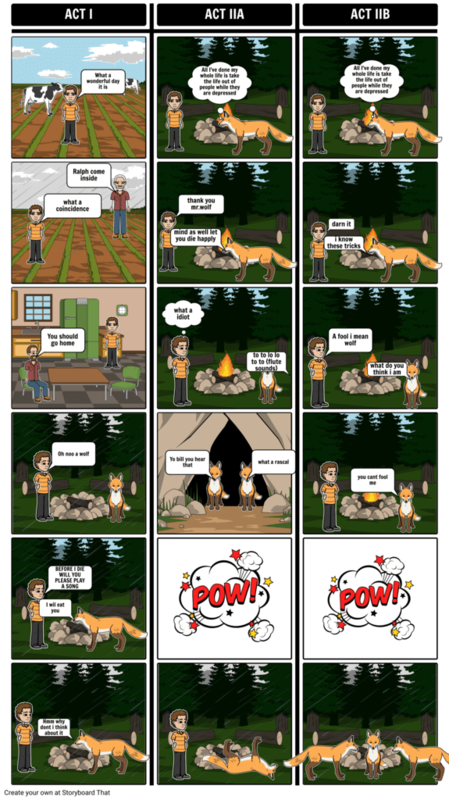 The Boy and the WOLF- Remixed by Munshi is licensed under a Creative Commons Attribution-ShareAlike 4.0 International License.